a tangible, marketable product, something to be cherished; and this is perhaps one of the biggest milestones in publishing your book. The SilverWood team cares a great deal about printing. We strive to ensure the books we’re creating are of the highest quality and will sit alongside any mainstream book on a shelf. To this end, it’s key for us as a publisher to have a working knowledge of the printing process and I was recently lucky enough to take a trip to Plymouth to meet the team at Latimer Trend and brush up on mine. We use a number of UK-based specialist book printers, including Latimer, for bulk printing in larger volumes to be stored with our UK distributor, so wholesalers and retailers can be offered the discounts they need to make transactions profitable for them. This means bookshops are more likely to consider stocking your book. Latimer Trend offer both digital and lithographic printing services and it is one of the oldest original printing companies in the country. Whilst there, in addition to being treated to a delicious Devon cream tea, Customer Service Manager, Andrew Denham, took the time to show me the production process for both printing options. After carefully planning an incoming job and a rigorous preflight (checking the artwork has been supplied correctly) printed proofs are generated for the publisher to approve. The job is then scheduled with either the digital or lithographic department. Starting with digital printing, which offers high litho quality and is suitable for shorter print runs, I toured the stand-alone digital facility where I could see the HP Indigo 7600 in action. 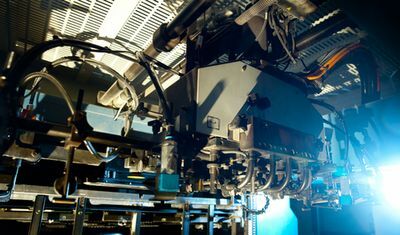 This choice of equipment, according to Latimer, is because "the use of blankets and wet ink technology simulates the Litho process" which ensures the highest printing standards are maintained. Within this digital facility there is also a perfect binder to ensure jobs can be completed in the same location for extra speed. As we moved through the workshop toward the lithographic machinery I was fascinated to see where the plates are made and was able to really begin to get to grips with how litho printing works. This printing technique involves the image (art or text) being reproduced on metal plates which are dampened by water and ink by the rollers on the press. Oil-based ink adheres to the image area and the water to the non-image area. The inked area is then transferred onto a rubber cylinder called a blanket and then onto the print media (usually paper). Latimer operate an 8 colour press, in addition to a 10 colour, the size of which is impressive. 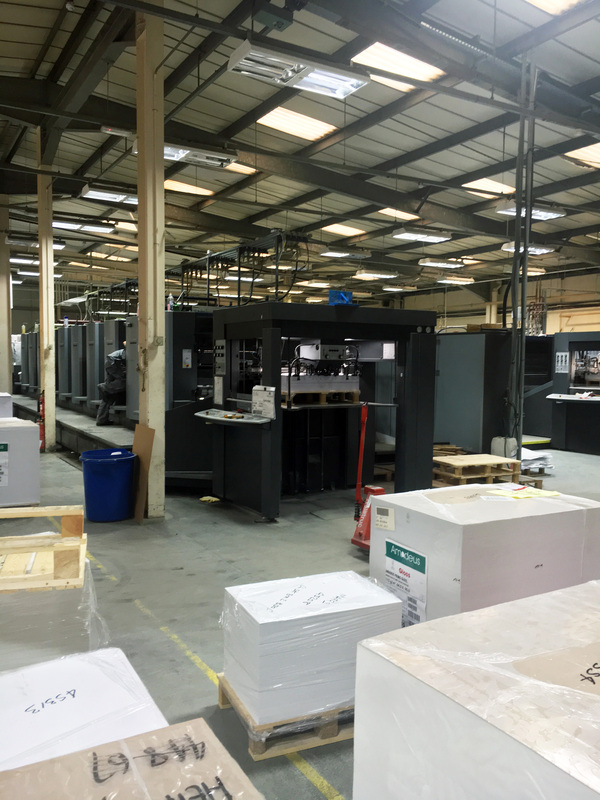 These huge machines enable vast quantities to be printed at economical cost, and the 10 colour press allows for the use of specialist, spot colours such as metallics and fluorescents. High-tech colour management technology is also used in the pressroom which, as Andrew explained to me, "ensures a consistent delivery of colour to an international standard". Once the sheets come off of the press they are allowed to settle (to prevent the rippling of pages) before being folded into sections which are then bound to the cover and trimmed at exceptional speed, before careful packing can commence for shipping. From start to finish it’s a complex and precise operation, which is very carefully planned due to the high number of jobs in progress at any one time, and it’s wonderful to see how it all works; strangely, the smell (which is much like the Design Technology department in a secondary school) is rather comforting too. We love to work with printers who are as passionate about books as we are and we’re confident the combination of professional book design and the right production method is the key to producing a book to stand out in today’s saturated marketplace. If you’d like to know more about publishing with SilverWood Books and bulk printing please email the SilverWood team. For feedback on your writing and whether your manuscript is ready for publication, consider our competitively-priced Reader's Report Service.